There’s nothing quite like fresh baked bread. Unfortunately, traditional bread recipes are often too complex for those with little cooking experience ­ or those who simply don’t have the proper ingredients. 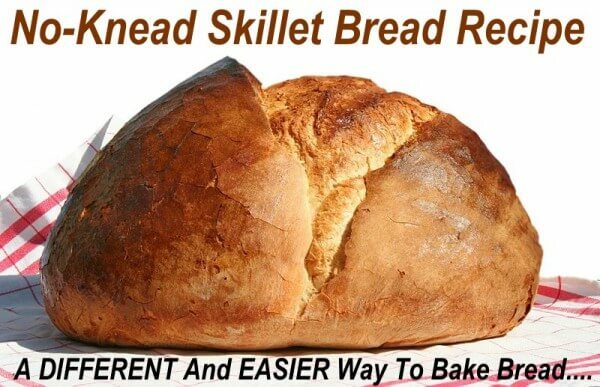 Thankfully, this no­-knead skillet bread recipe exists to provide an easier way to great, homemade bread. This is a basic­ level recipe. Feel free to experiment by adding ingredients to create a unique, one­of­a­kind skillet bread. Step One ­ Add 3 cups of unbleached, all-­purpose flour into a large mixing bowl. Step Two ­ A 1/2 Teaspoon of instant yeast in the bowl. If you only have standard dry yeast, proof the yeast by mixing 1/2 teaspoon with 1/4 cup of warm water. Let the yeast rest for five minutes before stirring. Step Three ­ Add 2 teaspoons of kosher salt and thoroughly stir the ingredients together. Step Four ­ Add 1 1/2 cups of water (warm or cold works just fine). Step Five ­ Mix the ingredients together with a dough whisk. If it’s not available, use a rubber spatula or a wooden spoon. Only stir the ingredients until they’re properly mixed together ­ remember, don’t over mix. Step Seven ­ Heat the oven to 450 degrees Fahrenheit. Once heated, place a cast iron skillet or pot into the oven for 30 minutes ­ this preps the skillet for the dough. Step Eight ­ Add a liberal amount of flour onto a surface covered with pastry cloth, if available. If not, any flat surface will do as long as it’s coated with flour. Step Nine ­ Pour the dough onto the floured surface, and using your hands, which should also be coated in flour, roll the dough into a large, round ball. Try to not to knead the dough during this process. Step Ten ­ Line the pre­heated pot with parchment paper and carefully add the dough into the pot. Step Eleven ­ Cover the pot and bake in the oven for 30 minutes. Step Twelve ­ After the initial 30 minute bake time, remove the lid and continue to bake for an additional 15 minutes to create a lovely crust. Step Thirteen ­ Remove the bread from the pot and place on a cooling rack. Allow the bread to cool for 10 minutes before cutting and enjoying.